Imagine the scene—you’re at your son’s first Little League game, and you promised him you’d take a video of each at-bat with your iPhone. During warm-ups you launch the Camera app to take a few shots and realize that your mobile device is rapidly running out of space. Mirage Lab’s MultiCorder is a video recording app that allows you to adjust the size and frame rate of the video captured by your iPhone 4, iPhone 3GS, or fourth-generation iPod touch, so that you can have a much finer level of control over how the storage capacity on your mobile device gets used. (While MultiCorder lists the camera-equipped iPad 2 among its supported devices, note that it doesn’t run natively on Apple’s tablet.) The app’s 2.0 update adds a number of additional features as well. And in the case of your son’s game, it just might save the day. The iPhone 4 shoots HD video at roughly 85MB per minute; the iPhone 3GS captures video at about a third of this, due to its standard definition camera. The quality is generally impressive, especially for a phone, but what if you just need to capture something that looks good enough? We Control the Video: From MultiCorder’s floating settings panel, you can dictate the quality and size of the video your iOS device records. When you launch MultiCorder, the app presents you with a few options to get started. There is the familiar Record button centered on the bottom of the screen; to its right is the Settings button. Tapping on this pops up a settings panel that hovers above the screen (though it would be very helpful if it rotated as you held your phone in landscape mode). From here, you can can choose you options that will dictate the quality and size of the video recorded. Beyond simply reducing the frame rate, you can also adjust the video resolution. There are more than 20 settings to choose from, ranging from full 1280x720 resolution (16:9) to more cinematic ratios like 2.35:1. Most of the common ratios have multiple sizes that you can choose from, which will impact the file size. For example, if you want to shoot 16:9 widescreen footage, you have five size options ranging from 1280x720 all the way to 720x405. You can also select the compression level at which your video will be shot. I found the combination of aspect ratio and compression level adjustment to be the quickest and easiest way to adjust the video size. I tested a variety of resolution and compression combinations, and watched them back on a 27-inch iMac to compare the results. I shot full size video, and dropped the compression level as low as 50 percent while still maintaining very decent results—and only using up half as much storage space. Turning three minutes of recording space into six may just be enough to catch those last two at-bats. From the start, MultiCorder has been about fine-tuning the space consumed when your iPhone shoots video, but version 2.0 of the app adds a number of other helpful features. 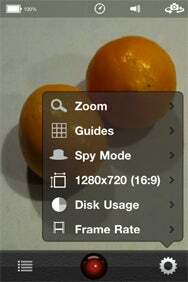 The iPhone’s Camera app allows you to zoom while taking photos, but not while taking video. MultiCorder gives you this ability while recording live. Like the camera, the results can be decent, but there is only so much you can hope to achieve with a digital zoom, and your image will quickly get pixelated if you zoom in too far. The default Camera app also allows you to use the iPhone 4’s front camera to shoot video, but you have to stop recording if you want to switch over to the camera on the back of the device. You can switch from the rear to the front camera while shooting live video in MultiCorder, and the app will insert a short flipping animation as the camera switches over. There are plenty of other options to choose from as well, like adjusting the audio sampling rate, locking the frame rate, and using “spy mode” which covers the screen with a static image so you can stealthily record. You can also upload your video directly to YouTube or Facebook; thanks to iOS 4’s multitasking capabilities, this can take place in the background, while you’re not using the app. Most of the time, people rarely think about things like video file sizes and formats when using an iPhone, but for those times when you need to—whether to save space, or to achieve a certain cinematic look—MultiCorder can be a big help and just might help you avoid missing a special moment.